Milan thrashed Arsenal in an amazingly dominant performance. Max Allegri went for the usual diamond in midfield. Clarence Seedorf started on the left but went off injured quickly, and was replaced by Urby Emanuelson. Philippe Mexes started at centre-back, rather than Alessandro Nesta. Arsene Wenger picked two natural full-backs, with Kieran Gibbs fit enough to start, but not fit enough to complete the game. Tomas Rosicky was a surprising choice on the left of midfield. As forecasted, this was a match between two completely different sides. Certainly not as forecasted, Milan maximised their areas of advantage to produce a ruthlessly efficient display. This battle was key. Milan had 4 v 3 in that zone, but Arsenal actually dominated possession – it was 55% at half time, and 57% at full time. In a way, this Arsenal’s first problem – the ideal gameplan seemed to be sitting back, soaking up pressure and breaking at speed. They shouldn’t have wanted to see lots of the ball. Surprisingly, despite a focus on attacking down the flanks this season, Arsenal were very slow with the ball and seemed happy to hold onto it for long periods with no direct threat. Milan didn’t see much of the ball for long spells, but they used the midfield advantage to great effect when they did have it. There was no obvious Arsenal strategy when they were out of possession – one would have expected either (a) Song to push up and leave Kevin-Prince Boateng free, meaning Arsenal could get tight to Mark van Bommel, or more likely (b) Ramsey to drop back off van Bommel, meaning Alex Song could pick up Boateng and the players on the side of the Milan diamond would be occupied. But neither approach was properly carried out in full – there was too much chasing in the midfield zone from Arsenal – none of the players really seemed to know their responsibilities, with the result that neither van Bommel nor Boateng were nullified effectively. Arsenal looked like 4-4-1-1 without the ball, with the wingers getting back into defensive positions and Ramsey slightly higher up, but they didn’t really need that extra support on the flanks. Song generally picked up Boateng when Milan had the ball, but tried to push up higher than him when Arsenal had possession. That meant turnovers were a danger, and Boateng’s movement for the first goal came from an initial starting position well in advance of Song when Wojciech Szczesny cleared poorly. Boateng’s finish was excellent, and like against Barcelona he tended to move to the right of the attack, as Robinho was drifting wide to the left. 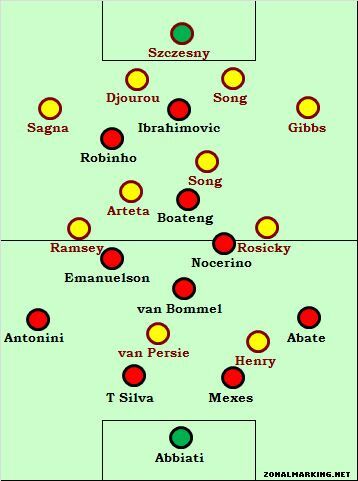 Milan’s strength in the centre was expected, but Arsenal were supposed to counter that with their pace down the flanks. This strategy was never put into place – the odd decision to start Rosicky indicated that Arsenal weren’t even pursuing that approach, let alone carrying it out successfully. Rosicky wasn’t particularly bad, but his tendency to come inside and slide balls towards van Persie made Arsenal increasingly narrow, which Milan were happy with. Robin van Persie found himself between a trio of Milan players and was isolated throughout the first half. There was a brief incident in the second half when Rosicky got past Mexes, and had his shirt pulled, with the Frenchman more than happy to take a yellow card to slow an attack. That was the only time Arsenal really got past the defence, and it showed how uncomfortable Milan were with the quick threat in behind, adding to the confusion that Arsenal weren’t doing this more often. Ramsey had a poor game, often making the wrong decisions on the break. His longer passes were also wayward, but at least he was often looking for diagonals to the flanks, which should have formed more of Arsenal’s gameplan. Theo Walcott was barely involved. The final area of Milan strength was with Zlatan Ibrahimovic, who Arsenal had no plan for. He seemed to surprise both Arsenal centre-backs in different ways – Thomas Vermaelen was outpaced by him, while Laurent Koscielny stood off when Ibrahimovic dropped towards the left of the pitch. As mentioned in the preview, Ibrahimovic plays more key passes that any other Milan player, and here he moved deep very well to slide balls through the defence, creating more chances than any other player on the pitch. The fact that he moved to the left worked well, because it is Vermaelen, rather than Koscielny, who is the player more comfortable coming up the pitch to close down a striker. Koscielny naturally stands off, and gave the Swede too much space before going off injured. Having three different centre-back partnerships (Koscielny-Vermaelen, Djourou-Vermaelen, Djourou-Song) clearly didn’t help. Wenger didn’t go with a width-based approach from the outset, and the decision at half time to take off Walcott underlined that. He pushed Thierry Henry upfront, and then lined up with an extremely narrow-looking midfield, with Ramsey right and Rosicky left in a 4-4-2. Whilst in theory this meant Arsenal might cope better defensively with bodies in the centre, this was an odd move if they were trying to get back in the game, which they clearly were. Walcott had been poor on the ball, but he’s always going to be more suited to a wide role than Ramsey, who naturally came inside, as Rosicky continued to do on the other flank. That meant that, with two upfront and four narrow in the middle, Arsenal were now attempting to take on Milan at Milan’s game, an amazingly reactive and timid approach. Alex Oxlade-Chamberlain emerged late on and made a couple of promising runs down the flank. In fairness, Henry did OK – van Persie was no longer isolated, and the two combined beautifully for the van Persie shot that forced Christian Abbiati into an excellent save. The Milan diamond became flatter when Max Ambrosini replaced Boateng – he sat alongside van Bommel with Emanuelson left and Antonio Nocerino right. That was seemingly a response to Oxlade-Chamberlain’s introduction – Milan wanted more protection for the full-backs. Milan still broke very well – the movement and decision-making on the counter-attack showed they were more than about brute force, and Ibrahimovic deserved his late goal after a brilliant all-round performance. These are clearly two very different sides – good in some areas, bad in others. One’s strengths are the other’s weaknesses, and vice-versa. Here, one side focused strongly on putting energy into their preferred areas, with Milan dominating the centre ground and outmuscling Arsenal throughout. The away side, however, barely even attacked down the flanks, and it wasn’t really clear what Arsenal’s gameplan was, or what they were trying to do on the ball. Milan certainly played well, but their performance was more about maximum efficiency than great skill. They actually only managed five shots on target in the game, and there were rarely slick passing moves or periods of utter dominance from them. They were just brilliantly ruthless when they went forward – ZM has questioned whether the approach of bullying their way past opponents is good enough to defeat top opposition, as shown by their poor record against big sides in Serie A – but Arsenal were weak, and Milan were brutal. This is a genuinely shocking result for Arsenal. In terms of style, Milan seemed the ideal side for them to face, because of their vulnerability to pace and width, but Arsenal didn’t show either of those features here. It’s staggering that Arsenal didn’t go wide more readily, and difficult to explain. In one of their long-running spats at the turn of the century, Arsene Wenger once commented upon Sir Alex Ferguson, saying that “His weakness is that he doesn’t think he has a weakness.” Wenger’s weakness is that he doesn’t seem to know his side’s strength. and that my friends…is a par! “Wenger’s weakness is that he doesn’t seem to know his side’s strength.” I’ve long thought that part of Walcott’s problem is that he is playing for the wrong club. They so rarely release him properly with a ball behind the defender. Did you think Walcott was on the wrong club when Arsenal had Fabregas? Having watched Denilson throw away opportunities to use little Mr Speedy, yes. At one point only the otherwise laughable Bendtner seemed to know how to release him. walcott is only at arsenal because he’s english, and if he moves it’s going to be to another deluded english club that can’t tell a good player from a bad one. the fact that arsenal are in negotiations with him to INCREASE his salary and keep him is grounds to fire everybody in management at that team imo. walcott can be devastating when he is played the ball behind the defender. It’s so infuriating watching the arsenal midfield fail to find him. its just infuriating full stop this year, so slow. So many times in that game somebody song/artetta/ramsey/rosicky would attempt to run the ball out of defence rather than hit a forward or diagonal pass longer than 15 yards and Milan would win possession high up the field as a result. I personally never understood why Wenger didn’t try arshavin in the centre for more than that 5 minutes, sure he can’t tackle or track back but at least he can pick forward pass. haha sry i like ZM but yesterdays preview was a complete fail considering the match! Even got the kit wrong! I hate how truthful this whole article is. Will you do Leverkusen – Barcelona? Oh, and remove that link at the end of the post? I just wanted to say thank you for all the effort put into this site!. Even more so when you participate in the comment sections. I think condition of the pitch played a part in Wenger’s tactics. The pitch was lumpy, especially in the wide areas. if that’s the case, it’s brilliant pitch doctoring on milan’s part. Looking at some fotos of the pitch on the web, I have the impression that the two ‘wing’ sections of the pitch are in a (deliberately?) different condition than the central (penalty box) strip. At least the colour is more brownish. Is it imaginable that Allegri and his staff foresaw Arsenal’s strength on the wings, and then made sure their field is more of an acre at the sides? Is Milan’s pitch always looking like that? The Meazza’s pitch was fixed a couple of months ago but because of the harsh weather in Italy, and the joint usage of Inter & Milan add to that the fixture list (League & Coppa & Postponed matches) the Italian FA decided to push on the two Milano teams; the field’s condition deteriorated in recent weeks. That said, Allegri always had the image of a manga villain… so..
hmm… wenger should have read your preview b4 starting the match…. i am astounded by his tactical naivety. why does he hesitate to start Ox-Ch? Not as much naivety but arrogance and stubbornness. He has a total disregard for any defensive shape or responsibility. I read once a very intresting quote from Fabregas that Arsenal never look at their opponents prior to a game, their focus and preparation is almost exclusively centred on practising ‘plays’ the Arsenal way. That sort of puts into perspective Wenger. He is obsessed with with aesthetic success and his team stinks of self-indulgence. If he were ever to win a major title, not only will he feel totally vindicated on what has been a era of failure, but would also wear a quite remarkable smirk across his face that demands another Emirates Statue. Reality is that Fabregas & Nasri were vindicated in doubts over Wenger’s perpetual fallacy. At the end of the game V. Persie would of gelt the same…. “If he were ever to win a major title”. Uh, are you joking? The only one he hasn’t won is the Champions League. I thought Milan’s defensive performance and positioning was spectacular. The workrate of Boateng and Robinho to get back to cover for out of positin teammates was a joy to behold as a Milan fan. Our defensive shape was a little diffrent than usual in that both Boateng and Robinho were dropping back in front of the midfield 3 to prevent the long shots. It was more of a 4321 christmas tree than our regular 4312. I am also extremely surprised that such a lightweight possessin shy midfield gave Arsenal so much problems and I think this performance flatters us in that I don’t believe we are that good. Having Aquilani back will help alot, and I think that we can sit deep if necessary against anyone and hold a cleansheet. To do well later on in the competition we will need to be clinical on the counter attack. Agreed. Milan had the a similar setup to the way that Marseille played against Arsenal where the front 3 bothered Arsenal’s back 4 making it difficult to play out of the back, while also sitting deep and not getting caught with space behind. Arsenal had time in midfield, but never really created anything due to poor movement and quick recovery by the front 3 to help out the defense. Astute setup. what was supposed to be an interesting tactical battle was spoiled by arsenal’s lack of energy and as you said lack of a clear plan. it might have been their plan to attack antonini but he was well protected and even when 2v2 developed the crossing was poor. Really good piece… wonderful closing two paragraphs. Great article. Van Bommel was tremendous. Well done to Milan; they played very well. But Arsenal… man, they just didn’t play to their strengths. Wenger’s approach should have worked if the pitch wasn’t so bad. Arsenal’s midfielders had the ball, but were poor with it because it was difficult to play football on that surface. Milan waited for the inevitable poor pass and broke effectively throughout. Because of their inaccuracies in passing Walcott didn’t really get the ball in dangerous positions. Most of Arsenal’s possession was too deep to really threaten. Arsenal’s strength has been attacking down wide areas this season, but seeing how ineffective Walcott and Arshavin have been recently, it cannot really be called a strength. Wenger didn’t trust the wingers that he had. And Koscielny’s injury meant one of his substitutions was lost (although pulling Song back there for Koscielny would have been a better move). Arsenal’s strength, in Wenger’s mind, was Henry and van Persie. The passing game wasn’t working, the collective approach had failed, so Wenger decided to leave it to his two strikers to produce some individual magic. They almost did with that flick and volley. And van Persie could have had a penalty as Mexes pulled him back. AC Milan also get credit for always being a threat on the break which meant Arsenal could never get too comfortable and have a sustained spell of pressure. You obviously didn’t see Zenits second goal yesterday then,but that’s not surprising since you obviously don’t watch much outside of your beloved best league in the world ever tm. haha your preview was a joke making out Arsenal were favorites and Milan would just roll over for them,but wake up the Donkey League is just a joke of a league now with very little quality.Milan would beat any English side. I still can’t believe you said Thiago Silva isn’t great on the ball LOL Eat your words now sonny jim. Because Milan played on a different pitch? One thing I didn’t understand was Arsenal’s defensive line. They were relatively high, and left damaging space behind them (Vermaelen’s positionning was awful), but not high enough as to pose a genuine offside trap, or allow significant compression of space in midfield. I think that was because Milan’s Boateng or van Bommel found themselves free usually. And Arsenal often tried to build from the back and gave the ball away in dangerous positions. I think he’s generally been good, apart from some notable errors that have been well highlighted on this site, and should still be improving things like positioning etc given his age. However, last night was probably the worst he’s played for Arsenal, he had a horrible game! Vermaelen is missing in the second formation, replaced by a second Song. “Two Songs, you’ve only got two Songs”, etc etc. All four of Milan’s goals were due to mistakes in defending by Arsenal. I’m not sure that the tactical battle was as one sided as you make it out to be as Wenger was trying to get his fullbacks forward to provide width. Fair enough. I think the interesting thing, tactically, was how Arsenal never really got into the game offensively. Milan had a great defensive setup. The Milan goals, 4 on 5 shots, were not very interesting tactically. They were the result of individual mistakes, not Arsenal’s defense being overrun. Goal #1: poor clearance leads to space for KPB to finish very, very well. Goal #2: Sagna inexplicably doesn’t close out Ibrahimovic, leaving him time to pick whatever ball he wants, Goal #3: Vermaelen slip, leads to space for Robinho finish. Goal #4: Djourou gets too close to Ibra, giving up a naive penalty. I struggle to see which of these goals was a result of tactics, especially the ones that you mention above. In each case, even an average player on a mid-table side could have prevented the chance by doing their job. The build up to most of the goal scoring situations were down to the tactics. The tactics meant that Milan were solid at the back and unbelievable effective at building. So once they gained possession, there was a good chance a goal scoring opportunity would arise, or at the very least, the ball was going to be played in Arsenal’s final third. Wouldn’t be surprised if Arsenal still went through. Milan are a truly awful team. Surely Wenger will go all guns blazing in the return leg and Robinho and Ibrahimovic will wilt away from home as they so frequently do. The only team I’d describe as awful is Arsenal. They hammered 5 past Chelsea and 6 past Bolton because those teams are just as fragile. Milan’s midfield and defence are composed of veterans who know how to close out a tie. They’ll ship a couple or three at the most but count on Ibra to pull one back assuming the 2nd leg does explode with goals. But Arsenal will play only one more champions league match this season. Mark my words. I think you’re dreaming a bit. Milan aren’t great, but neither are arsenal. In the epl arsenal are a top team, but the top teams in the epl have decline quite radically in three years. United and city couldn’t escape the group stages and now arsenal are embarrassed 4-0. The epl needs some talent at the top. Only city may be a top 5 European team next year. While it’s obviously pretty unlikely, primarily because Milan won’t be giving much away, and are certainly far from awful, I wouldn’t write Arsenal off completely yet. They did have a truly terrible game, seemingly outclassed in talent, desire, tactics and luck. 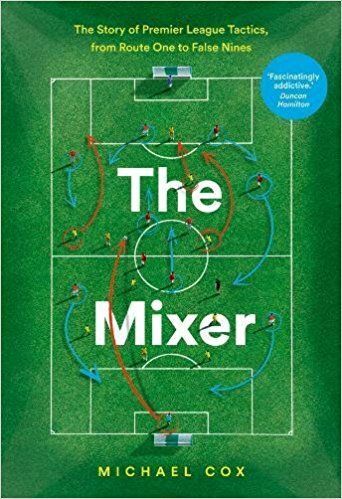 However they really did suffer with the pitch – their lack of confidence with footing and bad bounces discouraged the fast game down the flanks immediately. Walcott (yes yes) was struggling to control passes, Rosicky actually tripped over the ball a couple of times. Of course there was a lot more to the poor performance than the pitch. But in front of a home crowd, on a billiard table at the Emirates, if Milan start slow and Arsenal show some life, it could be a very different game. But Arsenal will need to figure out what to do in the middle of the field when they don’t have the ball. And how RVP will score without someone feeding him sitters. Arsenal might plausibly turn the tables in the second leg, but the big picture remains pretty dire. As they pointed out on Football weekly – vs Barca last year it was Song w/ Nasri, Fabregas, Wilshere. 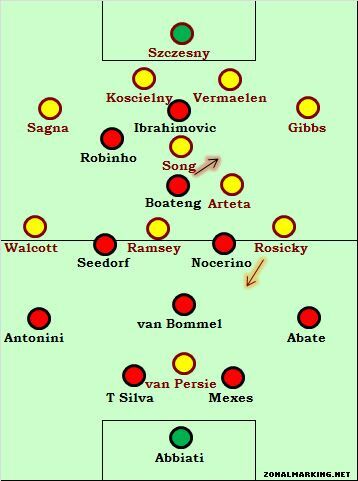 vs Milan it was Song w/ Ramsay, Arteta, Rosicky. I rate your opinions very highly, but your prediction’s looking pretty bad now – I wasn’t convinced by it at the time and it looks even worse now. Milan are a powerful, experienced team with a superb forward line. Arsenal are infamous for being fragile – mentally and physically – inexperienced, prone to stupid, rash mistakes and having a poor defence. Milan, unsurprisingly, tore Arsenal apart tonight. They tend to struggle against well-organised teams (especially top-level teams sitting deep and playing very compact.) Arsenal do not fit that description at all. In theory, Arsenal’s pace should have caused Milan problems. In practice it didn’t, for several reasons. Van Bommel was superb. Both full-backs had good games. T.Silva covered well. That’s the problem with using Tottenham last season as a reference point – Silva’s pace was missing from the back and Van Bommel wasn’t playing in midfield. Not only that, but Arsenal (as identified) never really looked to play down the flanks and, even if they did, don’t have much of an aerial threat in the box. A defence of Antonini-Mexes-T.Silva-Abate is also far from slow. Rather than Milan being tailor-made for Arsenal, it was rather the opposite. Arsenal’s weaknesses were brutally exposed time and time again. IIRC, you said that Van Bommel was important, so Arsenal should look to get him booked to open the game up, and mentioned Seedorf being a better deep-lying midfielder than Silva (but not that Silva’s presence at the back meant that Milan’s backline surely wouldn’t be as exposed to pace as a Yepes-Nesta partnership.) The point is that there was no way they would be as vulnerable to the approach which was successful for Tottenham last season and stood a much better chance than the preview suggested. I agree that Arsene got it wrong, though. Whilst in a better position to cope with width than last season’s Tottenham game, it is still the way to beat Milan. Playing Rosicky (who never seems to contribute anything) was totally baffling. I still think Milan would have won if Oxlade-Chamberlain had been playing – Arsenal’s backline simply couldn’t cope with Ibrahimovic and their midfield was too easily brushed aside (good spells of possession notwithstanding) – but it would have made it harder for them. Just a point of clarification: so ZMs prediction is looking bad…because Arsenal didn’t play in the manner he suggested they would? Or is it looking bad because Arsenal didn’t play with pace as suggested thus suggesting they would is a failure of…reading Wengers mind? Terrific article. I also love the AC Milan analysis linked from the article as well. Arsene’s in game decisions can be extremely poor at times, especially when losing and against top sides. I bet he is going to blame the loss on the pitch and how his wingers suffered so they went home with 0 away goals. Rosicky was awful. When I watch him play I feel like I could have made it as a pro. He makes Nasri and Fabregas look like legends. The only excuse Arsenal have are the injuries. I think Wenger used to be a good coach when he had top notch players but with a dwindling side he is just above average. Compare this to Mourinho who has won it all with Porto. Lastly, Allegri gave up way too easily on Taiwo. Your criticism of Arsenal’s defensive positioning is spot on. All season, and particularly apparent against Swansea, they have pressed ineffectively, with their midfielders racing out to challenges and leaving the defense to be stretched too much. The midfield trio has been pretty good this season, however, they lack any player with true pace to press and recover. I think that Wenger needs to re-think his pressing against the teams with real quality in counter-attack as it leaves the team way too exposed. I guess it did not help Arsenal’s backline particularly to lose one of their regular CBs (Mertesacker) practically just before the game. Everything got shuffled around. Vermaelen, who kind of had gotten used to play as LB needed to come back inside. A frustrating game to watch for an Arsenal fan. To amplify the “no game plan for Arsenal” point already made above: Arsenal at times looked like they were attempting to press from the front, but never with sufficient confidence or bodies. Conversely, Milan’s pressure on Arsenal’s defenders resulted in rushed, poor passing, or a pass back to Szczesny, whose (lack of) kicking skill contributed to loss of rhythm and possession. It is a testament to the individual skill of Henry and van Persie that between them they could have accounted for 1-2 goals. Arsenal had better hurry up or they’ll miss the chance to get Lambert. With the history of teams Wenger has put into this competition, this one seems to really be an outlier. And with the quality of a player like Van Persie on the ball, they don’t seem to be maximizing his potential in big games like these by playing the ball wide. “I don’t see them performing well against the Madrid’s/Barca’s/Bayern’s later on” .. not saying Milan are going to take it all, but they did hang with Barca 2-2 and 2-3 in the Group stage. Maybe outclassed at times, but they did what they had to do against the best team in the world. That was prior to Sanchez’ integration into the team. His pace would really do well vs. Milan I think. Milan – So effective today, it reminded me of when Chelsea used to crush Arsenal through brute force and power. Arsenal would dominate, then Chelsea would break and score and sit deep, which basically happened here. In defense, Milan looked so strong. The Central defense of Silva and Mexes easily dealt with Van persie and anything that Arsenal tried to get into the box – the sight of Sagna just lumping the ball into box hopefully and see it cleared time and time again. The Milan fullbacks were supposed to be a weak link, but they actually had pretty good games. Antonini pushed Walcott back and dispossessed him whenever he got the ball. Abate wasnt up against anyone and actually got forward well to stretch Arsenal a couple of times. But whenever Arsenal got close to their goal, Milan would drop back in numbers and Arsenal never even looked like scoring. In midfield, Van Bommel was also supposed to be a weak link, but with Milan allowing Arsenal to have the ball, his main role was on clearing up between the lines, which he did excellently (especially when Rosicky cut inside). Nocerino played a great game, usually pressing arteta or dropping back to help out, with both disrupting arsenals play. He also got forward well, timing his runs to sneak past the arsenal defense. Urby wasnt as effective and didnt have a great impact, he usually left Ramsey to get forward and helped out with walcott, while he rarely got forward to have any impact. Boateng was a player that really caught out Arsenal, he drifts between midfield and attack and its hard to track him. It looked Songs job to track his runs, but he inevitable got sucked up the pitch and Boateng played much higher up than his midfield position portrayed (the first goal showed this well). His goal was excellent technique and power, but his run was even better, ghosting past the Arsenal defense which didnt see him as there problem. The goal was the key to Milan being able to sit back, so the decision for Song to track him was a key decision and one they didnt get right. 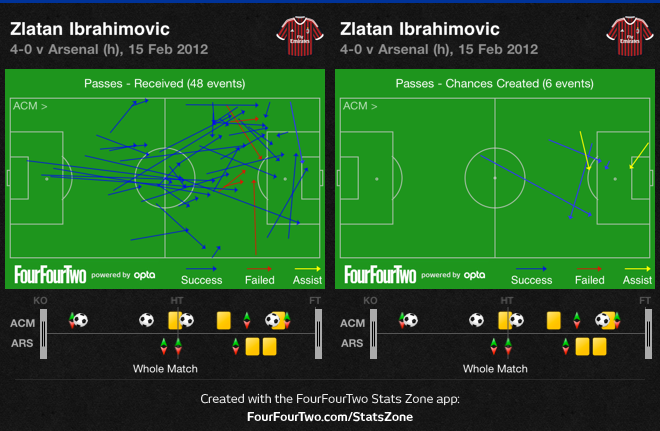 Up front, Ibra was fantastic, leading the line excellently and giving the team the creativity it needed. He dropped deep to connect play, hold up the ball and create chances but then also made himself a threat by running the channels (the second goal, though clearly offside, showed this). He was Milans best player and allowed the whole side to click. Robinho also showed an excellent performance, though not as crucial as Ibra’s, still important. He played narrow enough to escape the attention of the fullback (especially sagna) and was a constant threat; either by being a menace between the lines (dropping deep and running at the arsenal defense) or by making runs behind the defense (with Ibra dropping deep and looking to play him in). Overall, Milan were compact defensively and hard to break down, hard working in midfield (with good midfield runs) and incredibly fluent in attacks; the three of Ibra, Robinho and Boateng rotated and linked excellently, with one of them allways dropping deep and the other two making runs in behind. This sort of chemistry has been built up and will give them a good chance in the next round, of which they are surely guaranteed a place. When I saw the lineup had no idea what to expect, Rosicky on the wing again? Gibbs starting? I thought maybe AW does not want to get overun in midfield, but they ended up having RVP isolated with Mexes and Silva all over him. KPB and Robinho, provided good width when needed and Gibbs and Sagna never had a proper go foward, i must say Gibbs did’nt have a bad game,he was OK.
To me the stand-out player for Milan was Silva, he and Mexes really didn’t give Van Persie (or Henry, when he came on) a sniff – apart from the brilliant move you mentioned in your article. Every time the ball was played into Van Persie’s feet, Silva managed to get there first. I also think the issue of the pitch was too much of a coincidence to ignore – as you explained in your preview, both Arsenal’s greatest strength and Milan’s weakness lies on the wings; the wings of the pitch are relaid, badly, less than 48hrs before kick-off; Wenger decides to select Rosicky over Oxlade-Chamberlain. Despite the denial from Wenger that you quoted, he surely thought it was too much of a risk to pin his hopes on an area of the pitch that had been destroyed, and sought to cut his losses by selecting an extra passing central midfielder. The stadium Giuseppe Miazza is owned by the local authorities as opposed to AC Milan themselves, so it is the authority who will have taken the decision to relay this area of the pitch, just before any conspiracy theorists start spouting the usual bull. These local authorities were probably neutral, having 0 incentive at all to favor Milan, right? Reason that Milan’s 2 tops could have worked so freely? Arsenal’s fullbacks being assigned wrong task. Without a natural winger to match up in Milan’s 4-3-1-2, Sagna and Gibbs often pushed up to close down on Emanuelson and Nocerino, opening up space for 2FWs to drift out to. I mean, I understand that they are prone to this mistake, since 4-3-1-2 is a rarity in EPL. But I was amazed how Wenger did not do any homework and teach them! It is an open fact that Milan’s 4-3-1-2　often struggles against 3 back teams. By dropping Song, 3 CBs could have watched 2FW. He should at least have considered it as an option, since he had months to prepare! Exactly what I was thinking, too unconvetional to attempt though, if that was the case, perharps Coquilin would have been more comfortable covering drifting midifelders. I don’t think 3 backs would’ve been too unconventional. Many teams takes different shape when attacking compared to defending. All he had to do was to tweak his conventional 4231’s balance when defending, that’s all. Just by dropping Song b/w CBs when defending, it easily can be transformed to a 343 with diamond MF. MF’s diamond shape is perfectly symmetrical to Milan’s, so defending responsibility would be very clear and obvious. Also, since fullbacks can take a position higher than usual, it becomes easier for our fullback+winger combos to take advantageous position than theirs offensively. Arsenal – Played an awful game, Wenger got the tactical decisions wrong today. In defense, the problem started from goal, where the goalkeeper’s passing was poor and when pressured he would hit it long an lose the ball. He is overrated in my opinion; he gave the ball too much and for two of Milans goal, arguably should have saved them. I dont usually talk about goalkeepers, but with Arsenal fans praising him a lot this season as much better than Almunia and Fabianski, he hasnt actually been that good. Going back to the defense, the Central defense was exposed by Ibra. Verm was poor in positioning and when Kol couldnt cover arsenal were cut open. Ibra often dragged Verm out of position and this left space for Robinho and Boateng (and even Nocerino) to break into. At fullback, both gibbs and Sagna got forward, but neither were particularly effective. Gibbs didnt look sharp enough and Sagna wasted cross after cross (though this was more due to the wall of milan players defending deep in the penalty area). In midfield, Arsenal just didnt protect there defense well enough. Song was supposed to be tracking Boateng, but he took such high positions that he was clearly not his man to mark. In essence, Song wasnt up against anyone, though Boateng would drop deep onto song when Song was in possession. This meant Song ended up moving forward to help press the Milan midfield, but hsi left space infront of the defense which was horribly exposed. This left Arteta on his own in deep positions at times as he tried to cover for song. His passing was great and he helped Arsenal dominate possession, but his defensive skills were caught out at this high level as he failed to track runs from midfield (especially from Nocerino). Ramsey endured a poor night, asked to play high up and support Van persie, he rarely connected with the Dutchman. His passing was poor throughout and he constantly lost possession when trying to play the hollywood pass, when a more simple option was available. His inexperience probably cost Arsenal, and this was a game where they really missed Fabregas. Further forward, the decision to play Rosicky was a strange one and completely backfired. He moved inside where he found himself up against Van Bommel who had an excellent defensive game. His lack of width down the left, made Arsenals attacks predictable and I cant believe Oxe wasnt played from the start. The pressure was therefore on Walcott, but Antonini had a good game and Walcott never got high enough up the pitch to effect the game. He was forced to play deep where his lack of technique was exposed. Using the wings was supposed to be the key to Arsenal winning the game, but Rosicky never ventured down the left, and Walcott was driven back with ease, cut off from attacks. Van Persie, Arsenals strongest weapon, was completely isolated and in the first half he hardly touched the ball. He looked much better when Henry came on, if only because he could connect with someone and gain more space. The move may have helped Van Persie (with the lovely move involving them both an enjoyable moment) but it made Arsenal even more predictabke with walcott off. The Oxe came on late on, but wasnt given much time, and by then they were 3-0 down. Overall, Arsenal played into Milans hands, and Wenger was tactically beaten. In defense they were torn apart by the movement of the front three, in midfield they werent organised and failed to track runs or offer any threat or creativity themselves. In attack, Van persie was isolated and they didnt use the one weapon they had that could expose the one weakness everyone knew about Milan: there weakness down the flanks. The fullbacks were poor on the ball, Rosicky moved inside and walcott was pushed into deep positions. As an Arsenal fan, I have to say that this analysis is basically spot on with every point. Anyone know if this StatsZone application (or similar) is available for PC? I’m more than willing to pay for it, but I don’t have an iPhone or an Android. It seems to me that Allegri has looked at how United have dominated Arsenal – just sit back with men behind the ball and counter when they give the ball away(which they’ll do quite often nowadays). They did that excellently and although Arsenal usually had about enough men back, they didn’t know what to do against Zlatan. Everything put into his area sticked. Their decision making and calmness when in possession was top class. He got the ball and somehow he always found someone in a LOT of space. They didn’t have much possession(although one could expect them to have more possession with a 4 vs 3 in midfield), but when they did, something good came of it. Arsenal on the other hand – as said had no real width and although they seemed to be on top in the midfield battle, they struggled to pass and move. They seemed hurried and tense. Only Henry and Van Persie had the calm needed for such a game and Oxlade-Chamberlain seemed quite cool as well. And overall they seemed to lack ideas how to play through Milan. Time and again they either got the ball to someone isolated and under pressure or just passed it to a Milan man. They played in front of Milan the whole time and when Milan got themselves compact, then Arsenal just gave it away. Arsenal didn’t have anyone running in behind and Milan didn’t drop deep enough that Arsenal could play a one-two in or around the box to create anything. All in all the decision making was horrible from Arsenal – often they had a midfielder free and they didn’t use him. Arteta in the second half seemed lost that why he wasn’t given the ball when he was in space and could’ve moved the ball forward. It seemed like Arsenal were scared of Milan. All in all it was efficient, but nothing really special from Milan – they just weren’t tested by a below par Arsenal. I would say Ramsey personified this for Arsenal, he looked rushed on the ball and tried too many Hollywood passes. His lack of experience showed and he has looked poor in every big game he has played in. Arteta also lacked the defensive experience needed against top level experience, not tracking runs from midfield well at all. Compare them with Fabregas and Wilshire (who is so calm on the ball and actually tracks runs quite well) from last year and you can Arsenal are a much poorer team in midfield. What’s wrong with wenger this season? Terrible decision not to start your best winger (Chamberlain) and try instead to play with Rosiscky..
the stereotype of milan being slow is as geriatric as the players themselves. please note the attempted sarcasm. Totally agree, I recall Milan playing against Barcelona in Camp Nou for the 2-2 draw. Barcelona are the masters of playing width but on that day they couldn’t hurt Milan on the wide areas. This weakness about Milan being weak on the wide areas is a myth. My impression from the two ZM articles is not that he’s saying Milan’s fullbacks are particularly poor or slow, but that the system Milan play (with narrow midfield) can leave them exposed and so this is an obvious way to attack them. For example a run from full back can (in theory) easily create a 2 v 1, or drag central midfielders out of position. Did Milan forget this is two leg tie? They wasted at least 5 great chances, they should have at least scored 6 or 7. Horrible focus from Milan, will probably come back to bite them. i can’t tell if you’re being serious. yeah milan could have scored a few more but that’s true of nearly any team nearly any game. and a 4-0 lead is pretty comfortable. getting even one goal in the return leg would force arsenal to score 6 (!) goals, which is a near impossibility. Wenger obviously got his approach wrong but I can see why he thought fielding Rosicky to match Milan’s midfield was a good idea, after all Milan usually dominate possession (average 60% in Serie A). Is as if Allegri was one step ahead of Wenger even before the game started, Milan conceded possession and countered ruthlessly. In the end Arsenal barely did nothing right, didnt help that their defense changed so much throughout the game but Milan were efficient, that’s about it for me. 1) Vermaelen’s missing in the second image, and Song appeared twice. Still, baffling as to why AW never exploited the flanks more. Arsenal were lethargic, slow and could have hurt Milan if their passing tempo was a bit faster. Milan’s front three didn’t always get behind the ball and this is where Arsenal could have capitalised by having numerical superiority in midfield. Yeah, was about to say something similar. Thanks a lot for this report, ZM, and please, could you remove all those long nonsense comments here? Arsenal played two Songs in the side and yet still lost. That’s ’cause Song wasn’t on song last night. Vermaelen was anonymous in the 2nd half. .
seriously. great article as usual . a shots on target count of 5 v 4, shows Milan weren’t massively dominant.admittedly bit wasteful. Abbiati made a couple of good saves , which Sir Chesny couldn’t manage. a 3-1 loss still would have given a decent amount of hope to Ars. so ,daft as it sounds, their biggest failing was not scoring, rather than letting 4 in. take away a freak Verm slip or a soft pen for Ibra, and could have easily been only 3 let in. Love reading the comments, except for the obvious spam. Any chance of getting a ‘report spam’ button for the comments? Using it would give me so much satisfaction. I’m a little surprised by your surprise on the result. Arsenal is performing badly in PL and acmilan is the first in serie a.
the performance arsenal had yesterday qualifies them as a mid team in serie a, nothing more. nevertheless, most of the comments disregard italian team as average in the european scene. 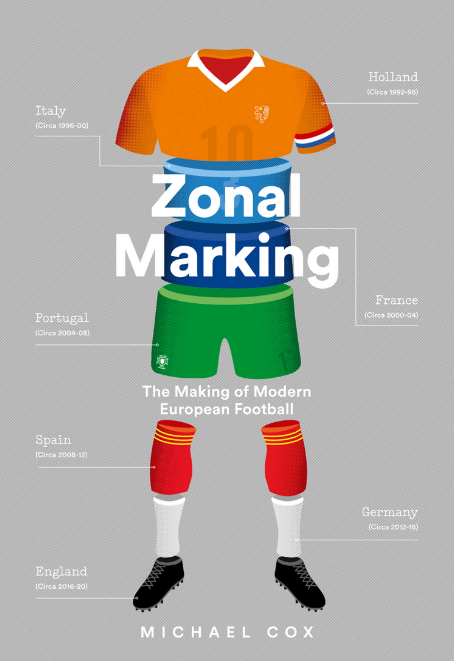 I believe there is a lot of superficiality in looking at italian soccer these days. i’d like to remember you the comments mourinho did before and after coming to italy to train intermilan, very different and much more respectful on the style of italian teams. another example is the FFT ranking of top 10 attackers, where ibrahimovic is not even mentioned….and the reason is only he is not playing in the right league. sorry for the blunt comment, but saying that arsenal could have won if only…….. given what we have seen and what we seen in the respective league is just funny. Serie A is no joke this year. 2-1 would have been a disappointment at home. Just wanted to say thanks for another excellent analysis. Great site! Arsenal definitely needs some quality on the wings. Walcott seems really overrated (as one would expect from an English player playing for an English team). He lacks the technique and crossing for being a top class winger and the composure in front of goal for a striker. And to add to that, without proper distribution his pace is largely irrelevant. Rosicky… especially when played on the left wing role didn’t make an impact. At all. I was really astonished that their perceived strength turned out to be their weakness in this game. Oxlade-Chamberlain could have made a difference, but it’s not an easy choice to start an 18-year old at the quarter final of the CL. Probably should have played though..
Would it be really harsh to say that the players Wenger has at his disposal just aren’t top class anymore? It’s hard to deny that it’s not easy to replace Fabregas and Nasri. The worst part of Arsenal’s performance was that basically his best starting 11 was out there. The only ones missing were Wilshere(who hasn’t played all season) and Gervinho. Guys who are supposed to be key performers like Vermaleen, Sagna, Song, Arteta, Ramsey, Walcott(who is usually a good player in Europe) all were poor. And it looks like this sight is getting too popular with the ridiculously long post and the white supremacist spam. Yes, great article once again ZM, and i also think it’s time get some form of control over the comment section. Too much free reign for idiots. Although i must say that most commenters are quite civil and reasonable. That’s why i like reading the comments i guess. What is maximum efficiency if not a great skill? I think they dominated the play almost as well as Barca did against Leverkusen. They didn’t have 80% possession as Barca did but Arsenal never looked dangerous with the ball in the first half. If you look at the shots on and off goal the stats are similar to Barca – Leverkusen. I think Abate and Thiago Silva deserve more credit. Abate was absolutely relentless in trailing Rosicky high up the pitch and denying him time and space, which lead Rosicky to rely on very simple passing. He also kept on drifting to more and more central positions because of this, which obviously played perfectly into Milan’s hands. This was in extreme contrast to how Richards dealt with Ribery in the group phase, where he just ”kind of” closed Ribery down, yet never really challenged him for the ball. One might argue that Ribery is twice the player Rosicky is, but it was very impressive still. Thiago Silva on the other hand ”Koscielnyed” RVP, and stepped up constantly from the defensive line to cut out passes intended for Van Persie. This lead RVP to, either due to Wenger’s instructions or his own decision, dropping deeper and deeper to lose his marker. And whereas Chamberlain coming on was the obvious move, I don’t think Wenger made the most of it. Henry absolutely loves the pocket between the opposing right CB and FB, yet Arsene instructed Ox to play mostly on the right flank, which really isn’t an effective way to stretch Milan’s right side of defense. Excellent piece once again, though! Thanks. Dont think Wenger should take too much blame for this result. Since I can remember whenever Seria A team have played BPL teams they have always adopted a certain style where by when they defend they sit back in two banks of 4 and try to close in runners from getting behind their last line of defence. They rarely try and close down the attacking side as shown by when Mourinhos Inter went to Barca with 10 men, Mourinho summed it up brillant when he said “We didnt want the ball, because without the play we keep our shape” this is want Seria A teams tend to do but credit to Max Allegri he saw how poor Arsenal do when teams press them in packs and thats just what Milan did in Arsenals half when they had the ball, forcing them to make mistakes and give the ball away. This most likley took Wenger by suprise as Milan didnt do this against Spurs last season and Inter have not done it in the CL this season. People say Ox should have started but not instead of Tomas but instead of the massively ineffective Walcott. Wenger played Walcott and the only source of real pace to trouble Milan and he let him down. Walcott actuallt played worse than 4 years ago when he sprinted past the Milan fullback to square for Ade to tap in and give Arsenal a 2-0 win. Wenger used the same game plan as 4 years ago and it would have worked if not for Max Allegri’s brillant tacticle implamentation and Walcott’s poor performance. My interpretation of this match is that Wenger/Arsenal deliberately decided to drop out of CL asap so they can focus their strength on the PL so to secure a CL (qualification) spot. I guess Aresenal/Wenger are decided to go shopping this summer, and without playing CL the following season that won’t be possible. To be honest, I think that the last thing Wenger wants to do now is sacrifice a trophy on purpose. He may not be the brightest bulb in the chandelier, but he’s not /that/ stupid, and I’m sure he has at least some awareness of his current situation. If Wenger wasn’t going to play wide he should of played Oxlade and Rosicky as number 10’s close to RVP, with Ramsey and Arteta behind and Song as a sole holder. Then left Gibbs and Sagna to bomb on. ZM..give Milan their proper due..if you saw the match you will know that it is not just brute strength but also some “slick passing” and excellent positioning that gave Milan the opportunity… i think you are basis-ed against the red and black half of milan, and not just on this article. Just one addition to this excellent piece – I was amazed at how often Ramsey found himself in the same 5 yards of the pitch as Arteta in the second half. It was totally bizarre – I can’t remember seeing anything like that from a top club in a long time. Arsenal looked to be playing for a 0.0 at half time and. moment of magic from vietnjd guard to saveta draw going into the good leg . . . End of the day the articlesays it best tactical naivety led to a deserved whipping and looks like another trophless year for the gunners and the caveat of playing nice football isn’t even appropriate anymore – they’re gash! Wouldn’t even win the SPL… And thats with rangers docked points for going into administration!!! He also says, “We felt powerless today to get into the game.” Which is in itself a pretty damning verdict of the performance from himself as well as the players. To be good against Milan, you have to be organised in central areas defensively and be willing to play wing play to attack the space down the flanks. This played to Milan’s strength, as they didn’t have to worry much about getting stretched wide and instead allowed them to overload Arsenal in central areas. He doesn’t know how to get involved in the game effectively, if he can’t get space. Simply hasn’t got enough variety in his game to cut out the inconsistent nature of his performances when out on the wing for Arsenal. Still hasn’t convinced me suits Arsenal consistently enough, in that position anyway. Strange the purpose of Ramsey and Rosicky last night. It was like Ramsey wanted to stand right next to Arteta and Song when receiving the ball from them. He was drifting around very ineffectively and ended up choking Arsenal’s passing options. This season, I have had my criticism of Ramsey’s position in the side in the post-Cesc Arsenal. He simply doesn’t have enough of a presence and guile when playing behind RVP. He is still only 21 and has time on his hands but I still think he is better off playing deeper, instead of so far forward behind RVP. I think Felipe Melo would be a good choice for Arsenal. He’s not so expensive, I guess, and he would fix this midfield easily. The question will be what players will Milan field in the second leg? If Pato can get his touch back, I’d consider using him, as his pace could counter Arsenal who I assume will be using only 3 players at the back. Only saw extended highlights but it seemed Milan pressed Arsenal really well when they won it at the back. I know Arsenal dominated possession but they seemed to give it away cheaply from the back a few times, particularly when they had to go back to Szczesny who just hoofed it clear. His kicking wasn’t great and they simply gave the ball staright back to Milan. Changing formation for the one game where it seemed to be perfectly suited was quite incredible. I think if they had just gone to sit back and try to knick it, it might have made sense but they didn’t and the defending was just shocking. As always a very good report. Worth noting how important Boateng was to the team. Perhaps an example of the what the new-style playmaker should be. An all-round talent whose skill is based around exceptional movement and energy, whist still possessing passing ability and technique (the lovely back-heel to Robinho springs to mind). Shirokov as well, a strong, traditionally defensive midfielder, with his runs from deep for Zenit’s win over Benfica yesterday highlighted the added functional element that embodies the modern creative outlet in a team. On a more general note it was wonderful to see Milan play so remarkably on the European stage, certainly the way it should be. What a pathetic display from Arsenal!! Was expecting a wonderful match but was yawning for most part.. Lack of any imagination from Arsenal.. combined with stupid defending for which they were so famous for quite some time now.. This match should enlighten those questioning Mertesacker’s ability.. He is definitely slow which the whole world knows.. but his positioning and reading of the game is so much underrated.. It showed clearly yesterday when both Vermaelen and Koscielny were pathetic in positioning. They looked much better when Mertesacker was playing even though he was not spectacular (which is actually a mark of a good defender).. some even suggested this was their perfect back 4..
Why Wenger did not start with that Oxlade guy is a wonder to me.. in spite of the fans’ reaction some weeks ago. He was the only one who looked to create something.. Ramsey, Rosicky etc. are useful players but not creative players.. he could have started with Henry instead..
Now, they can say good bye to CL and concentrate on the league. I don’t know for sure, but watching the game i realised that Milan acknowledged Arsenal’s strength down the flanks and when Boateng was drifting to the right, Milan looked more like a 4-3-3 with Robinho or Ibrahimovic wide on the left (those 2 switched positions for the second and third goal). So i don’t think Arsenal lost merely because of their own mistakes but also because of Milan’s awareness. It’s true Wenger is inept tactically but still Milan should be given their just recognition because even if a better tactical approach from Arsenal could have caused them some troubles, they are without question the team with the most quality. As much as tactics play a decisive role in the outcome of a match, the players’ quality and drive is just as important, if not more important, and Milan, player for player, is far superior to Arsenal in every sector. The point about Milan bullying weaker opponents and struggling against stronger teams because of their functional midfield is valid but imo they only struggle when they have to take the initiave in the game, and in Serie A they always have to take initiave. However Arsenal had more possession and Milan was ruthless when breaking. Against Barcelona they also put up a good show because Barça took command of the match. I think Milan could still surprise some people in the CL. that is true, Arsenal definitely lacked quality in there team, Wenger basically said the 2008 team was much better than this one. IMO they lacked quality at fullback and attacking midfield, with Gibbs and Sagna poor at providing attacking penetration and Ramsey showing how much Arsenal miss Fabregas. also its been a while since Arsenal’s CBs played against a team which had a 2 Striker formation..meant that we dint have a spare man in Central defence, we are generally used to do the mop up work (even against Manure/Spuds, Rooney/faart are generally marked out by CDM (Song) leaving a spare CB).. Ydy with Ibra, Robinho drifting on to the wings/even sometimes offside positions our CBs looked totally lost (2nd goal for example (Ibra behind Sagna, Robinho in an Offside position)..or even the aerial duels which Ibra won, there was no one to clearup.. Of course with the benefit of hindsight, 3 CB formation with an extra man from the MF would have worked wonders in not only letting us have extra man to mop up behind but also allowing them to have more possession and thus creating more chance for us to break with pace on wings.. Cox, What do you think about this? Wasnt it a classic case for a 3 man Central defence formation? I picked up in the preview a ZM comment regarding a “broken team”. Initially you’d expect that to be a failure on Milan’s part, but it ended up working tremendously well with Ibra, Robinho and KPB unplayable on the break. They were linking up with the kind of “outside the (thinking) box” passing that once defined Arsenal. In defence, it was almost like 4 centre-backs, tightly squeezed narrow; Van Bommel expertly just ahead, and the remaining 2 of Nocerino and Urby making sure Arsenal’s (poor) full-backs didn’t get up to any tricks. In truth it was a fairly predictable strength on Milan’s part and attacking their full-backs , attempting to get an overlap with Sagna/Walcott or Gibbs/Rosicky would’ve made sense (as ZM points out the lack of width). Arsenal’s poorness on the flank was also highlighted by awful crossing (and no targets to aim for). Wenger has identified this lack of strength in height/presence up top in the past (Adebayor, Chamakh, even Bentdner perhaps) but it’s difficult to keep such a system in ‘the playbook’ when it’s essentially a grudging plan B. Arsenal were therefore worse than ‘playing into Milan’s hands’ i.e. taking them on centrally. They seemed neither central or wide. Unable to bring RVP (their USP) into the game. An utter disaster really which probably flattered Milan slightly. Great piece though, thoroughly enjoyed it. Milan’s real/average formation is a 3-5-2 or 3-4-3. Van Bommel, Mexes, and Silva are the three defenders, with MVB between those two. Abate and Antonini are, on average, midfielders/wingbacks rather than fullbacks. Against such a formation Arsenal should have surely played a 4-4-2, with Song and Arteta deep to spray balls to Walcott and Oxlade on the wings and take advantage of Abate/Antonini’s movement + RVP and maybe Arshavin toward the middle to pressure Milan’s back three. Why Arsene decided to play with a narrow 4-3-3 is completely unfathomable. PS: the 3-5-2 is the formation de rigeur these days. Barca effectively plays a 3-5-2, Napoli do, Milan do, and Roma do. Personally i felt sorry for Song tonight – wasnt easy to be up against Boateng, Robinho and Ibrahimovic who formed a triangle around him, and I dont think he got much help from Arteta who struggled. Was mightily impressed with Milan on the counter but even more so with their defensive shape and work rate without the ball – says a lot if a possession conscious team like Arsenal struggled so much, and ultimately failed, to break them down! It was a curious match indeed, I believe you have to be very open-minded to be able to analyse matches like this. Using a reference point of a team having success against AC Milan (Tottenham last year) is very poor in my view – in that match AC Milan were a worse team than they were against Arsenal. Given how they are performing this year, Milan’s style has changed. Thiago Silva played as the holding midfielder against Tottenham, he played in central defence here. Also, a different formation was used. Initially, against Spurs, Tottenham started with 1 striker (Ibra) with Robinho dropping off him. Against Arsenal, they had a Christmas-tree shape, instead of having 2 forwards (Ibra, Robinho) and Boateng in behind, they had Ibra up-front alone with Robinho and Boating (left and right, respectively) in wide positions just below. This counters the myth that Milan are weak on the wings – they scored 3 goals from wing-play against Arsenal! They have become more brutal – but they are also becoming more innovative in how they play. You get the feeling Milan are underrated in the same way Arsenal were underrated in 2006 in the Champions League. They stuck in against Barcelona, in 2 tough group-stage matches and several Barcelona players commented on how difficult it was to play against Milan. Barcelona are the masters of wing-play and exposing wide areas – against Milan they couldn’t really do it that well. Given just how complex it is to analyse 22 men on a pitch, this match surprised a lot of people; one feels being intricate and interested in football analysis is not enough to understand football matches, and this is in my view why the preview ZM did is all wrong – it doesn’t really use football “theory”, it uses out-dated (where they ever in?) myths about styles of play. You need to be adept at understanding the contextual factors (Milan are first in the league), the history (Milan have reached several finals with Ancelotti) and also some knowledge of statistics shows that Milan were not only the in-form side coming into this, it can be said Arsenal are tailor-made for Milan to attack! One last point. Put 22 random men, who have never played with each other, on a pitch together – they will struggle to beat anyone. Arsenal built a new team in the summer and naturally they were weak initially – the 8-2 loss to Man Utd showed how little structure there was in pressing, defence, offence, etc. Arsenal have some structure now – they’ve had 6+ months to play and gel together. But a very simple law is this; the better team you face, the more your weaknesses get exposed. Arsenal may be well-gelled to beat a Sunderland or a Blackburn, but faced with teams who have great positional skills, they need to learn how to defeat them. It’s a new experience. I cannot even begin on the mistakes Arsenal made and the negative feedback to it – I have written several paragraphs alone and do not feel justified in mentioning at just how “bad” Arsenal are in comparison to the past. One feels not sympathy for Wenger – but a curiosity, how can such a talented manager get it so wrong? Just like in chess, a strong and well coordinated advance through center triumphs over weak flank play. Thankfulness to my father who shared with me on the topic of this web site, this weblog is genuinely awesome.